Kathy and Bob were initially a little nervous about their first ever virtual trip but were excited by the idea of avoiding the 19-hour flight from Sydney to Rio. Not to mention the yellow fever and typhoid vaccinations required for real life travel to Brazil’s second-largest city. Founded in 1565 by the Portuguese, the colonial seaside city of Rio de Janeiro (‘River of January’) grew steadily in size and prominence, importing African slaves, exporting sugar from the plantations and coming under regular attack from pirates and buccaneers. After the discovery of gold and diamonds in a neighbouring province, its future as a serious port was established. Napoleon Bonaparte’s invasion of Portugal upped the ante still further, when the Portuguese royal family and most of their courtiers fled from Lisbon in 1808 and reestablished themselves in Brazil. For 13 years, Rio de Janeiro became the only European capital located outside Europe. Creating a new capital in an already functioning city wasn’t entirely straightforward. Previous inhabitants were evicted without ceremony to make room for new palaces, academies and public buildings. 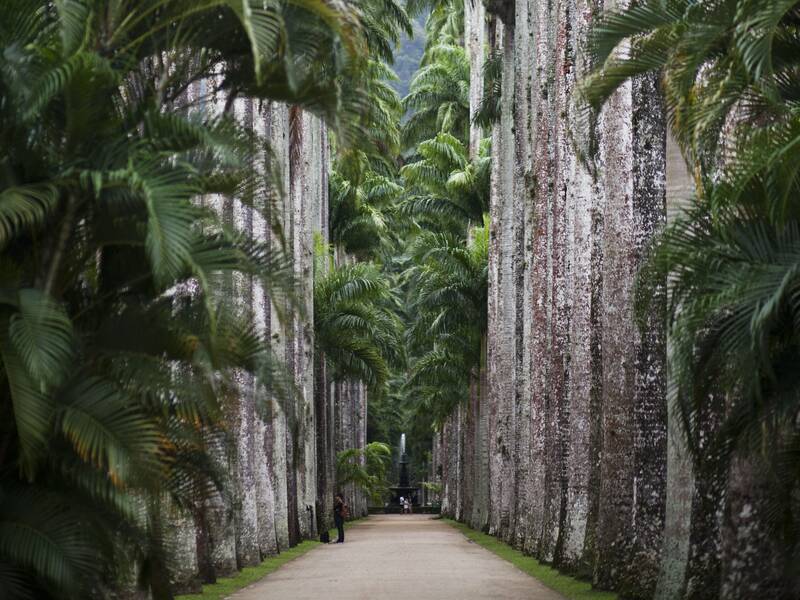 During the first year of the new capital, the Jardim Botânico (botanical garden) was created. It was initially intended as a place to acclimatise the spices such as nutmeg, cinnamon and black pepper imported from the West Indies, but later expanded into a significant research institution with a 32,000-volume library. The royal court returned to Portugal in 1821 and Brazil achieved independence from the empire the following year. 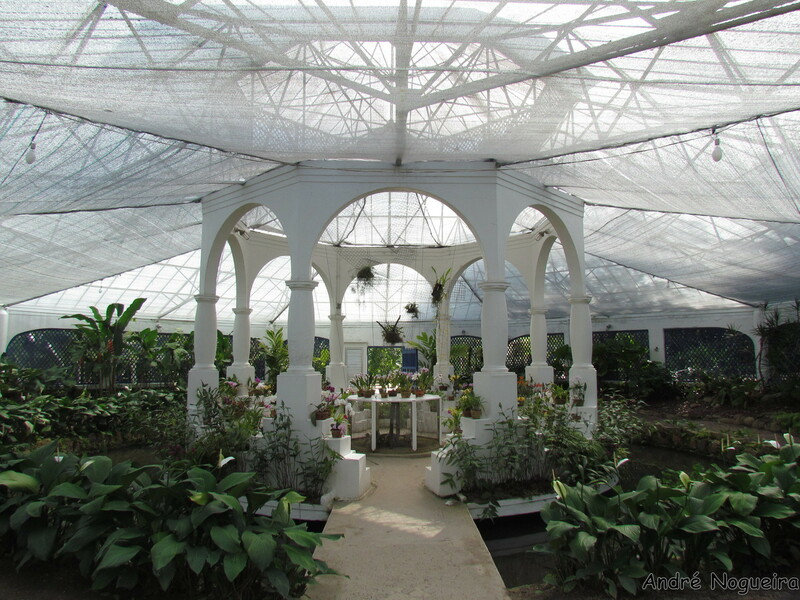 The 137-hectare botanical garden, with its 8000 species of plants, was the logical first stop for a keen horticulturalist like Kathy. She and Bob stopped near the main entrance to the gardens to buy breakfast tapioca from a street vendor: thin crepes made with cassava and stuffed with condensed milk, coconut and banana. Even so early in the day, it was already warm and intensely humid. Graffiti embellished parts of the outer walls of the Jardim Botânico, and the rich smell of gently decaying plant matter rose up to meet them as they wandered around. 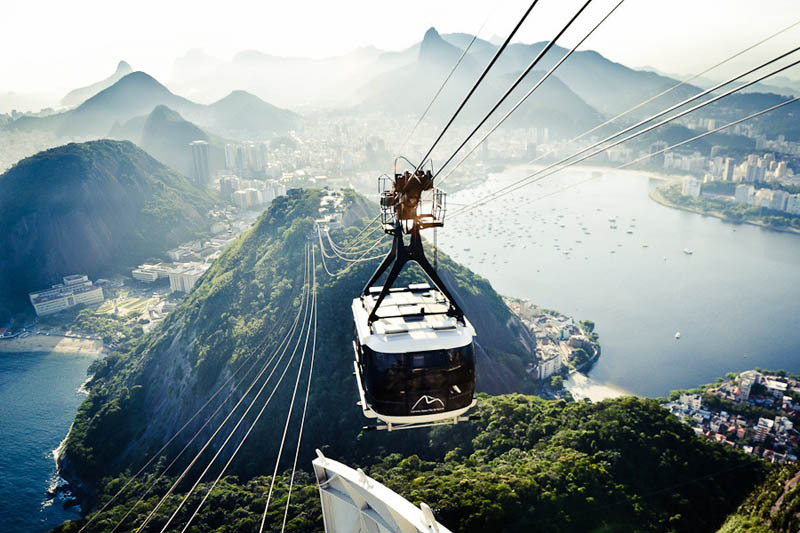 Corcovado Mountain, topped with the iconic Art Deco monument Christ the Redeemer, soared above them and the distinctive shape of Sugarloaf Mountain, a granite and quartz monolith rising almost straight from the water, lay a few kilometers to the east. 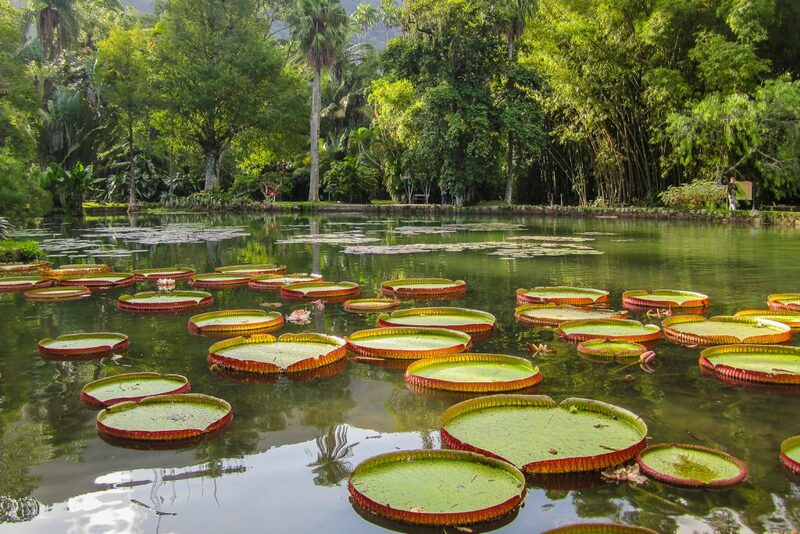 Exploring the gardens, they were struck by the towering avenue of Royal Palms planted when the garden first opened, the lake filled with Victoria amazonica (enormous water lilies) and the orquidário, home to 600 orchid species. By a stroke of good fortune, Kathy found herself engaged in conversation with a couple of staff members. When discovering her horticulture training, Felipe and Beatriz offered to take her on an impromptu tour of the library and Dimitri Sucre Benjamin Herbarium. Bob casually announced that he might pay a visit to the nearby planetarium and meet back with Kathy later, a solution that suited their fundamental interests well. Bob, with a long history of quietly researching trips beforehand, had also divined that the view from the top of Sugarloaf Mountain would be worth seeing. After a morning of plants and planets, he and Kathy met up at the cable car station in Urca, on the far side of the world-famous Copacabana beach. Not for the fainthearted, the two-stage ride to the top of the mountain offered spectacular views back over Rio and the sea. They decided it was possibly even more terrifying on the way back down. After a quick lunch of seafood and salad in a waterfront café, Kathy and Bob headed 45 kilometers west to visit the former home of Brazil’s best-known landscape architect, Roberto Burle Marx. While revered for his 20th century avant-garde and modernist gardens, his talents weren’t limited to landscape architecture. Instead, he was an artist, musician and a keen naturalist, being one of the first people to call for the conservation of Brazil’s threatened rainforests. He was also responsible for bringing into vogue a love of Brazil’s native flora, previously considered second-rate in comparison to European plants. Born in São Paulo in 1909, it wasn’t until his family moved to Germany that Roberto developed an interest in the flora of his homeland through frequent visits to the hothouses of Amazonian plants in the Berlin-Dahlem Botanical Garden. Returning to live in Rio de Janeiro, he became known for certain stylistic traits such as mass plantings of the same species and never mixing flower colours. Although he allowed himself more latitude in his own property in Barra de Guaratiba, this aesthetic was still obvious to the visitors as they wandered through the property. A couple of hours later, Kathy and Bob agreed they were ready to head back into town. Dinner, as arranged by their virtual travel agent on a hot tip from an industry insider, was to be at Estrelas Da Babilonia, a favela restaurant with an amazing view over Copacabana towards Corcovado Mountain, and they wanted to be there in time for sunset drinks.